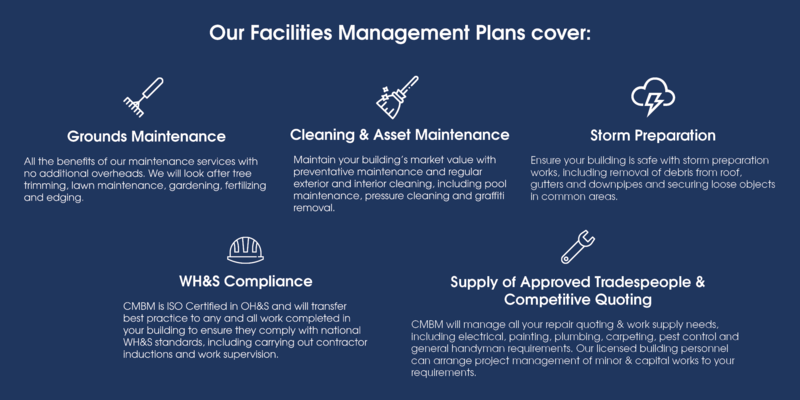 CMBM Facility Management services reduce the need for multiple service providers and create a seamless service for communication to ensure your facility is maintained with regular maintenance, auditing and reporting. CMBM utilise technology to ensure fast and efficient response times for urgent requirements and proactive actions to ensure all possible precautions are made to avoid these occurrences and conform to all legislative compliance. CMBM’s forward-thinking solutions and agile maintenance plans provide your facility with a full-service integrated management plan across not only our building maintenance, cleaning, grounds and asset maintenance divisions, but also with WHS compliance, repair specifications, contractor supervision, storm preparation, and more. CMBM manages your building’s compliance with state and federal building safety standards, including Fire Service Audits, Emergency Management Plans and BCA Compliance Audits. Why Facilities Management with CMBM? CMBM are fully ISO Certified in OH&S, Quality Management Systems and Environmental Management Systems. Additionally, we maintain pre-qualification with CM3 and Browz, and ensure all operations are conducted with respect to environmental risk consideration. Read more about our Certifications. We offer the benefits of a large, ISO Certified organisation, with the care and trust of a locally owned business. All work carried out by CMBM is checked in accordance to our complete service guarantee on performance & expertise.